Eye Screenings, exams, and eyeglasses for Pre-3, Pre-4, and Kindergarten students will be a new project for the Little Elm Lions beginning this August when school starts. With the help of The Lions Organ & Eye Bank we will have the necessary state of the art equipment to pre screen our 3, 4, and 5 year olds for sight corrections. If they need an in depth exam, that will be provided for them. If they need glasses and can not afford them, those too will be supplied at no cost to the families when ever possible. Community Health Fair - Since 2003, this has been an annual event in the community. It is held at the Lakeside Junior High. Health Professionals, and community health education programs are presented. Blood pressure & cholestorol screenings are offered. 75 Eye screenings were done. We are continuing to follow up with those that were in need of a full eye exam and glasses. Autumn Fest - is an annual event held in Little Elm Park (outdoors). It has been very well received by the community, offering a Carnival, food, socializing, live entertainment, children’s activities, as well as booths operated by local businesses and organizations. Our Lions Club participates each year with a booth to hand out information about Lions Clubs International, provides a sign-up sheet for those interested in membership and holds the annual "Pretty Baby" contest with prizes for the entrants. This along with the Ducky Dash (in the past) and raffles have been fund raisers as well. FOOD BANK - Each year our club gives service assisting the Food Bank during Thanksgiving and Christmas. We provide ongoing monthly support in the form of spaghetti sauce each month. Members of the club take turns working a two-hour shift simply greeting members of the community with a smiling face! Additionally, for the past three successive years we have been able to present the Food Bank with a check for $1,000! Scholarship - Only graduating Seniors who plan to attend college or a trade school can apply. The Little Elm Lions Scholarships are based on community service, grades, personal essays, and letters of recommendation. For the past severel years we have awarded Senior Scholarships to LEISD students with money going toward the school of their choice. Last year we awarded a $800.00 scholarship and will do the same for 2016. 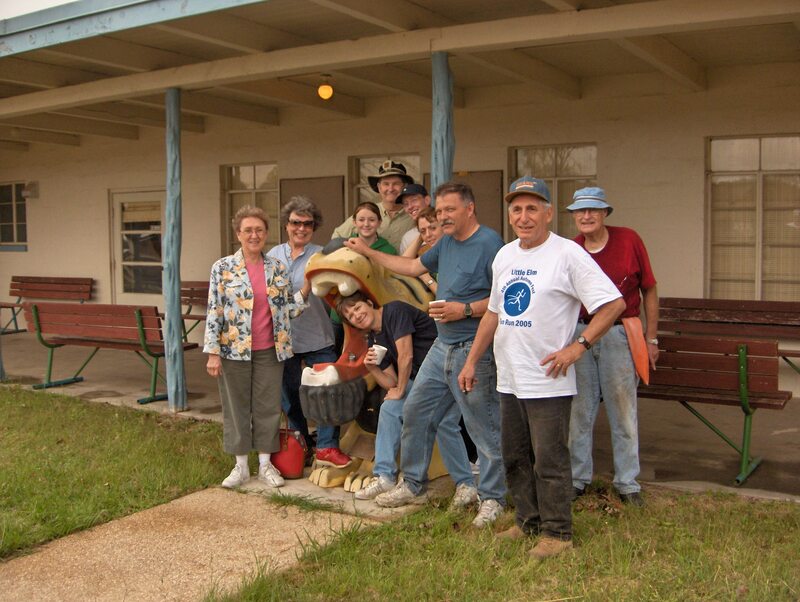 Texas Lions Camp - For the past three years, our club has sponsored and paid all expenses for two special needs children to experience a week at summer camp in Kerrville Texas designed especially for their needs. The Texas Lions Camp has all the Doctors, nurses, physical therapists and facilities to provide a wonderful summer camp experience for children who might otherwise never attend a camp. We look forward to trying to sponsor more children from our local community in the future. 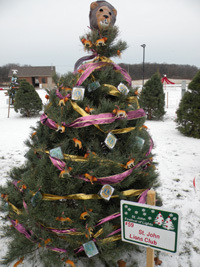 Christmas Angels - Each year the town of Little Elm has a Christmas Angel Tree. Our Lions Club chooses 12 Angels to shop for. We have a wonderful time experiencing the true meaning of "giving with a purpose" to children who might otherwise have a less than merry christmas. Drug Awareness Poster Contest: Each year over a thousand posters are distributed to the school art teachers for a competition on the subject of drug awareness. Cash rizes and ribbons are awarded by grade category, then by Best Overall or Grand Prize. Those entries are then submitted to the District Level for judging, and if placed, then on to State, Region, and National competitions. This year a 4th grader won Best of Show and a 1st place in District and came away with$200.00 in cash prizes! Pancakes with Santa- Every year we have a community breakfast with our special guest Santa. We do it at the high school and pictures are avaialable for purchase. We also have vendors to get some of that christmas shopping done while having a bite to eat. If you are interested in helping out, or want to get a vendor table, let us know as soon as possibe as spaces will fill up fast.